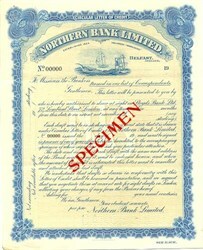 Beautifully engraved RARE specimen certificate from Northern Bank Limited printed in 1929. This historic document was printed by Waterlow & Sons and has an ornate border around it with a vignette of a ship at sea. This item is over 76 years old. Northern Bank, is a commercial bank in Northern Ireland. It is one of the oldest banks in Ireland having been formed in 1824. In 1970, the Northern Banking Company Limited amalgamated with the Belfast Banking Company Limited to form what is now known as Northern Bank Limited. The bank is considered as one of the Big Four in Northern Ireland, and issues its own banknotes. Since 1 March 2005 it has been owned by Danske Bank. Until 1988, the bank was a subsidiary of the Midland Bank. In 1987, the bank's operations in the Republic of Ireland were re-organised under a subsidiary company, called Northern Bank (Ireland) Limited. In 1988, Northern Bank was acquired by National Australia Bank, upon which the operations in the Republic of Ireland were renamed National Irish Bank. Northern Bank then introduced a new logo, a stylised "N" in a hexagon shape. In 2002, the bank's logotype (the word "Northern") was changed to match that of the National Australia Bank. In December 2004, Danske Bank agreed to acquire Northern Bank (and National Irish Bank) for �967m. Don Price will remain as CEO. On 1 March 2005 the sale of Northern Bank to Danske Bank took effect, following regulatory clearance. As part of this process, National Irish Bank in the Republic will be separated from the Northern Bank and given its own dedicated management team. Both Northern & National Irish Bank will also move over to Danske Bank's technology platform, and also adopt a variation of the Danske Bank logo as its corporate identity. This occurred on 18 April 2006, with the bank's website displaying the new logo as early as 14 April and at least one branch being refitted on Easter Sunday, 16 April.